The UH-1 is a military helicopter powered by a single, turboshaft engine, with a two-bladed main rotor and tail rotor. The helicopter was developed by Bell Helicopter to meet the United States Army's requirement for a medical evacuation and utility helicopter in 1952, and first flew on 20 October 1956. Ordered into production in March 1960, the UH-1 was the first turbine-powered helicopter to enter production for the United States military, and more than 16,000 have been produced worldwide. The UH-1D variant was designed as a troop carrier to replace the CH-34 then in US Army service. 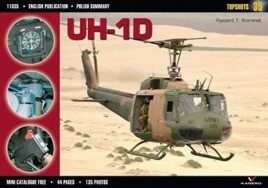 This monograph covering this US helicopter includes many detailed photographs, making this an ideal publication for the modeler.